The most used trailhead along the Glacier Point Road is for the short paths to Taft Point and Sentinel Dome, two overlooks of Yosemite Valley that are much less busy than the main viewpoint at the end of the road; of the two, Sentinel is more popular though Taft has slightly better scenery, being less obscured by trees. 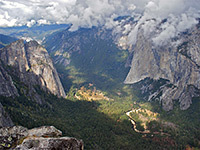 The hikes start at a layby 2.2 miles before Glacier Point, on the west side. In summer the carpark is often full by mid morning so vehicles have to be left further away, alongside the road. Taft Point topographic map, Glacier Point Road trails. 10 views along the Taft Point Trail. 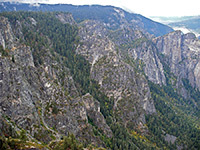 Panorama over Yosemite Valley from Taft Point. The path to Taft Point traverses a small open area, leads down a slope past an outcrop of white quartz and into pine forest where it fords the upper end of Sentinel Creek, then crosses a granite hill, climbing a little and re-entering woodland on the far side. The tall ponderosa pine trees grow quite densely in places, and many are edged by thick patches of bright green moss. 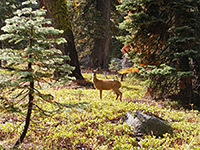 0.5 miles from the trailhead is a junction with the Pohono Trail - right leads to Sentinel Dome after 2 miles, left is to Taft Point and other overlooks further west. The left branch descends gently to the edge of the forest, giving the first views of Yosemite Valley, and finally down a steeper, treeless slope to the cliff edge, where the Pohono Trail branches off, heading back due south towards Bridalveil Creek. 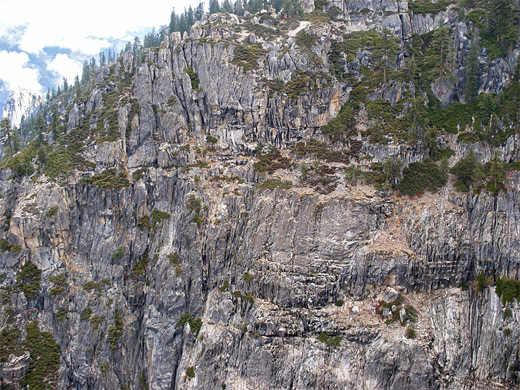 Near this second junction are a series of narrow, vertical-walled cracks in the edge of the granite cliff, known as The Fissures. The path follows close to the rim for a short distance and ends at a small, railed, north-facing overlook which has good views across a ravine to Profile Cliff, a vertical, unusually cracked and striated wall of granite. A fair amount of Yosemite Valley can be seen though better is to walk further west right to the far edge of the point, where the rim is unguarded and precedes an almost sheer drop of 1,600 feet. From this promontory Yosemite Valley is in full view up and down, from the peaks of Cathedral Rocks on the south rim, across El Capitan Meadow to its famous neighboring cliff, then east over Eagle Creek, the Three Brothers and Yosemite Falls - see panorama. The distance to this overlook is 1.1 miles with only a 240 foot elevation change. The round trip along the Taft Point Trail can take less than an hour.